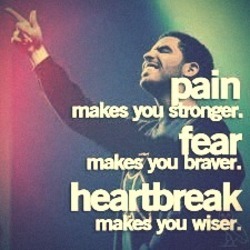 Pain makes you stronger-fear makes you braver-heart brake makes you wiser! I NEVER TAKE MY OWN ADVICE EVEN THOUGH I KNOW RITE FORM WRONG AND I TOLD MY SELF I WOULD CHANGE SOME OF MY HABITS THIS YEAR FOCUS ON MY LIFE AND MAKE BETTER CHOICES AND MOVE ON FIND MY SELF BECAUSE I AM NOT THE SAME I ONCE WAS ! I AM SOME ONE FILLED WITH MEMORIES AND NEW EXPERIENCES. SO FAR I BELIEVE I AM DOING THAT AND IT HASN'T BEEN SO HARD TO DO SO BUT NOW COMES THE HARD ONE MOVE ON/MAKE BETTER CHOICES.? ?